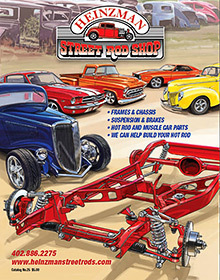 The Heinzman Street Rod Shop catalog has a wide selection of parts, components, bodies, sheet metal and complete chassis setups for your project. Request a printed catalog or view or download the catalog in its entirety on-line. This is a large PDF version that may take some time to download. The catalog is also download-able in smaller sections for faster view. Click on any of the links to quickly locate a specific part or component.